The ICT Heat Meter for HVAC and building services is an all in one in line compact heat meter (also known as a heat integrator, BTU meter or energy meter) that is used to measure in kw/hr the energy used to heat water. It is economical solution for flow rates up to 2.5m3/hr. ICT Heat Meters have a choice at the time of ordering of a pulsed output in kw/hr or an Mbus output. 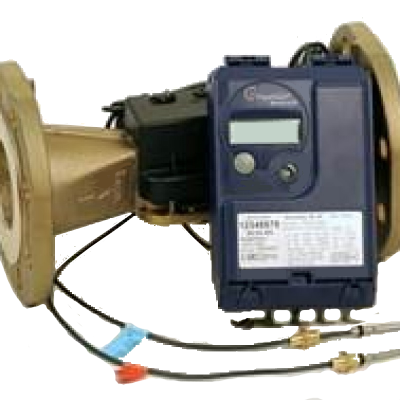 For larger flow rates use a multi jet or Woltmann hot water meter (or a cold meter for chilled water applications) in conjunction with a wall mounted heat energy calculator. Also, 2 temperature pockets must be used, one for flow and the other for return.